View the CN Tower on a Google map. Where can I learn about the CN Tower? Fame: Former World's Tallest Building* and Free-Standing Structure (1976 to 2007). *The "World's Tallest Building" designation was added in 1996. - Height: 72 stories, 952 feet. - Rank: This building used to be the 12th tallest in the world, until 1996. - Occupants: 8000+ people daily. - Floor space: approximately 2.3 million sq. ft.
- The tallest building in the Commonwealth. - The blue sign on the building is one of the highest signs in the world. Fame: Canada's Tallest Office Tower. View First Canadian Place on a Google map. 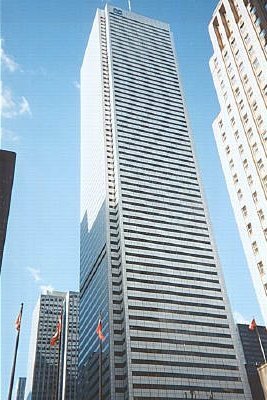 Where can I learn about First Canadian Place? Fame: World's largest rectractable-roof stadium. - Volume: 56.5 million ft3. - Rogers Centre has the world's first fully retractable roof. - It takes 20 minutes for the roof to fully open or close. - Rogers Centre's field can hold the equivalent of 516 African elephants, 8 Boeing 747s, or the Roman Colosseum. - Rogers Centre's playing field area is covered with 106 rolls of Astroturf, which is held together with 12.8km of zippers. View Rogers Centre on a Google map. Where can I learn about Rogers Centre? Fame: World's largest shopping and entertainment complex. - Total Area: 49 hectares (121 acres), equivalent to 104 Canadian (115 American) football fields, or 5,300,000ft2. - Total Construction Cost: CDN$1,200,000,000.00. - Parking: Over 20,000 vehicles, World's largest. - Indoor Lake: World's largest. - Indoor Wave Pool: 2 hectares (5 acres); World's largest. - Indoor Amusement Park: 37,160m2 (400,000ft2); World's Largest. - Bungee Jumping: World's only indoor location (inside the water park). - Hotel: 354 rooms, 118 of which are "themed". View West Edmonton Mall on a Google map. Where can I learn about West Edmonton Mall? - Design life: 100 years. - Basic structure: shore to shore bridge; no causeway component. - Structural materials: reinforced, post-tensioned concrete structure. - Length: 12.9km, crossing the Strait at its narrowest point. - Width: 11m from guardrail to guardrail, including one lane and one emergency shoulder in each direction. - Typical elevation: 40m off the water. - Typical clearance: 28m off the water x 220m wide. - Navigational span elevation: 60m off the water. - Depth of strait: up to 35m. - Main bridge footings: gravity foundation on bedrock. - Main bridge piers: octagonal hollow shafts. - Main bridge girders: precast concrete box girders ranging from 4.5m to 14m deep. - Main bridge spans: 44 spans, 11,000m total; 250m/typical span. - PEI approach bridge: 7 spans, 580m in total. - NB approach bridge: 14 spans, 1300m in total. Location: Prince Edward Island/New Brunswick, Canada. Fame: One of the longest continuous multi-span marine bridges in the world. - Owner: Canada Lands Company. - Height: 1,815' 5" or 553.33m. - Construction time: 40 months. - Total weight: 130,000 tons (23,214 large elephants). - Volume of concrete: 53,000 cubic yards (40,523.8 m3). - Public opening: June 26, 1976. - Official opening: October 1, 1976. - Visitors per year: Approximately 1.7 million. View Confederation Bridge on a Google map. 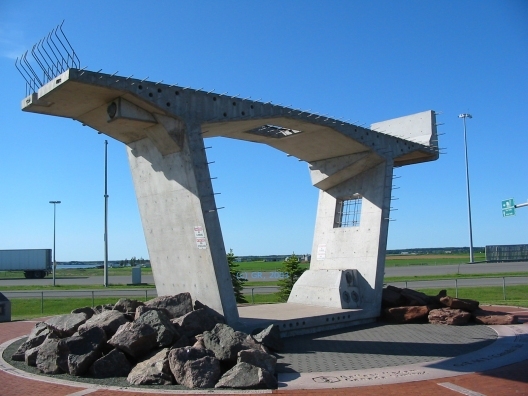 Where can I learn about Confederation Bridge? 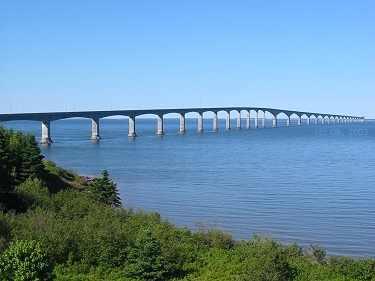 Visit the Confederation Bridge website. - Third tallest building in Toronto. - Height: 51 stories, 863 feet, 265m. - Part of BCE Place, which won an award for the most beautiful office building in Canada. - Designed by: Skidmore, Owings & Merrill. - TD Tower was designed with so many stepbacks as the result of a survey that asked employees what they wanted most in an office. Most said they wanted large windows and corner suites. The stepbacks yield as many as 16 corner offices on some floors. Fame: Canada's Most Beautiful Office Building. View the TD Tower on a Google map. Where can I learn about the TD Tower? Location: Offshore Newfoundland (Jeanne d'Arc Basin), Canada. Fame: Canada's Largest Offshore Drilling Project. Where can I learn about the Hibernia Drilling Platform?